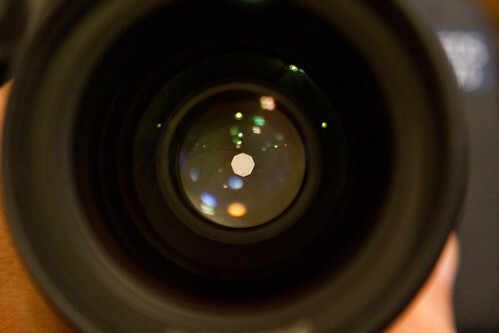 Part 4: What is Aperture? As I progress in my photography, more and more friends have come to me seeking photography advice. I’ve already written a post advising people why they should get a DSLR, but I guess I’ve kinda left them hanging a bit once they’ve gone off and purchased those DSLRs. So, even though this breaks the progression of the "food photography tips" I had been planning, due to popular demand I will try my best to explain this whole aperture business. The first thing you need to understand is that getting good photographs is all about learning to control the light that comes into the camera. Confused yet? Let’s take a look at some examples. 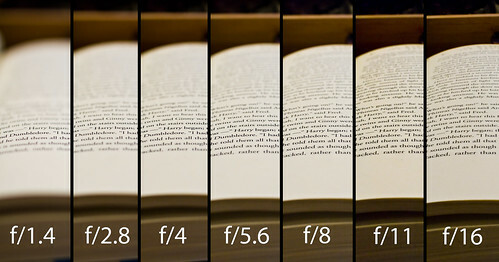 Check out these photos I took of the 5th Harry Potter book (just finished it!). On the far left (small f/stop number), I’m focused near the bottom of the page, and you can see how only certain lines are in focus. But as I increase the f/stop (number goes UP), more and more gets in focus. Let’s look at a people-example, too. In these portraits I quickly shot, you can see how Taylor is nicely in focus and the background fence is a pleasing blob in the background. But as I increase the f/stop, the fence gets more and more in focus, until finally you see how ugly it actually is. In general, the blurrier the background, the more "artsy" and "pro" your pictures will look. Therefore, to get the strongest effect, you want to shoot with the aperture wide open, or that is to say, with a SMALL f/stop number. It’s not always that simple though. You may run into certain complications in certain shooting situations where you NEED more to be in focus. For example, when you’re taking a picture of your food on a plate, do you really want ONLY those veggies at the front of the plate to be in focus? Maybe you want to have the whole plate in focus! In reference to my Harry Potter shot, do I want to highlight a specific line? Or do I want to just have a clean shot of the entire page? Figuring out what you want the shot to look like in the end is key to mastering aperture. 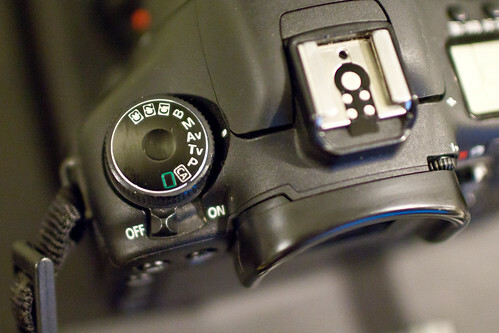 So, how do you change the aperture (f/stop) setting? 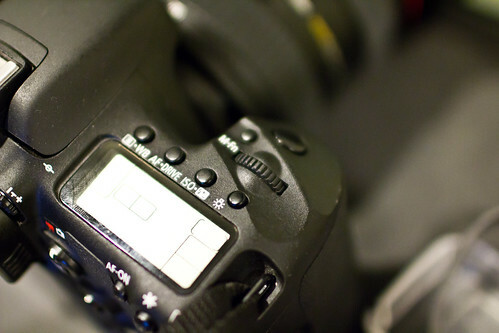 A good place to start with messing with your aperture is with the AV setting on your camera. 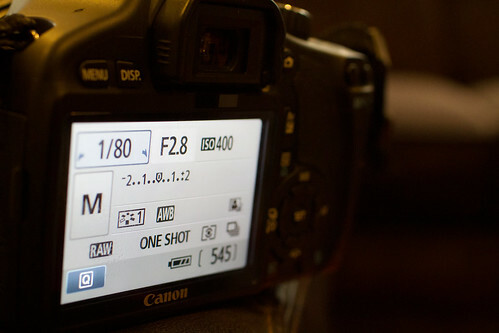 This setting will have your camera automatically set everything else EXCEPT for the aperture. Getting a good exposure is being able to carefully balance all three of the things I highlighted at the beginning of the post: aperture, shutter speed, and ISO. But when you’re just learning, better to eliminate the clutter and focus on just one thing. AV mode will let you do that so you can experiment. Keep in mind, if it’s a dimly lit room, you may still need to stabilize your shot in order to make sure there is no motion blur. (Tip #2!) 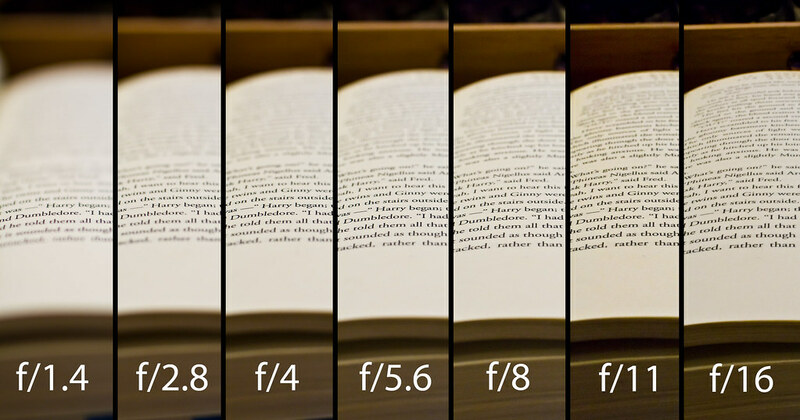 Different lenses have different maximum apertures (how small the number can get). The heavier, bigger, more expensive lenses (and of course macro lenses, which are made to do this) can get REALLY wide (as wide as f/1.2 — meaning tiny depth of field/only a small amount in focus) but others can only get as wide as f/4 or thereabouts. You should still be able to experiment with it, but here is my recommendation for a lens to REALLY take advantage of aperture and learn how to use it: Canon 50mm f/1.8 or Nikon 50mm f/1.8. 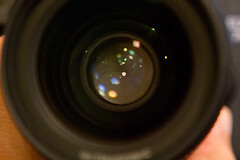 My sister Gretchen uses this lens almost exclusively, and she gets some very nice photos over on her blog. Good luck! Please leave some links to pictures you’re taking, and whether or not you want any critique! I would love some picture feed back! I have the same lens as Gretchen, http://www.supersana.com/2011/09/06/ugh-rain/ How can I take better close up pictures? Like of the chicken? Thanks! Poughkeepsie!? You’re like 15 minutes from me! Have fun at the wedding. I can probably guess where it’s being held, hope the weather gets better, it’s gross and cloudy here right now. Shooting in manual mode really does make such a difference. Thanks for the refresher. And to Sana, lighting & composition make a huge difference. I live near Poughkeepsie! In fact, I might be there today. Enjoy the Hudson Valley. I love these posts, so helpful, thanks!! Now I’m dying to understand shutter speed and how it fits in with the rest! Glad you’re on the right path, Katy! Practice makes perfect! We’ll definitely talk about shutter speed soon! Hi, I have a Nikon D3100 and I am having trouble getting the blurred look in the background. i have changed the setting to just “A” and adjusted the numbers and each time the pictures still look the same. Do I only see the blurred image when I upload the pictures to my computer or should I be seeing it on my playback? I am just playing around with my camera and am new to this. Any help is appreciated, thank you! C) add more separation between your subject and the background. The farther away the background is, the blurrier it will appear. Okay they are all linked under my “Health Tips & Favorite Posts” tab! Thanks for this post. I have started a food blog (secrettkitchen.wordpress.com), and although some of my day time pics aren’t too bad, most of the ones I have taken in low light are awful. Most of the meals I have made are being served in the evening, so it is inevitable that low light photography will be required. I have a good camera, but I don’t really know how to use it (all the gear and no idea! ), so I am going to try some of the tips you suggested and try to get some better pics. Good luck – hope the tips help! In the start, the info was little confusing. But, in the middle of the write up, you could explain it well. An informative and detailed write up indeed. Actually, Aperture works as a pupil of the human eye. The pupil determines the value, how much light it should allow into the retina. Value of aperture in photography holds the same importance. 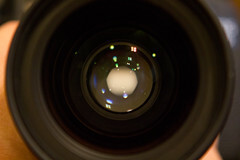 Aperture is embedded in the camera lens. Aperture is made up by several blades stacking together. It opens diagonally to let the light in.